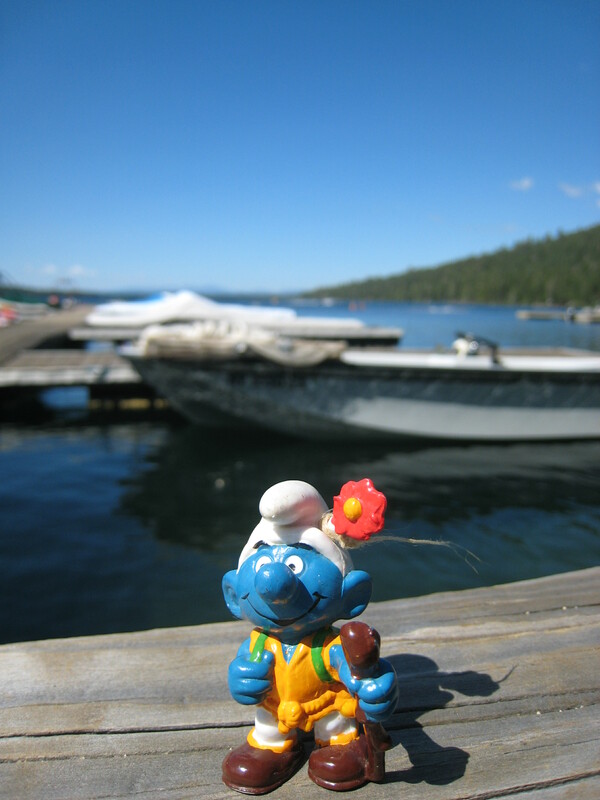 Now that he has found his way out of the box in the garage/storage, Hiker Smurf has taken to the trails with alacrity. He loves hiking. He loves being outside. He loves nature. He also enjoys photobombing my scenic shots. 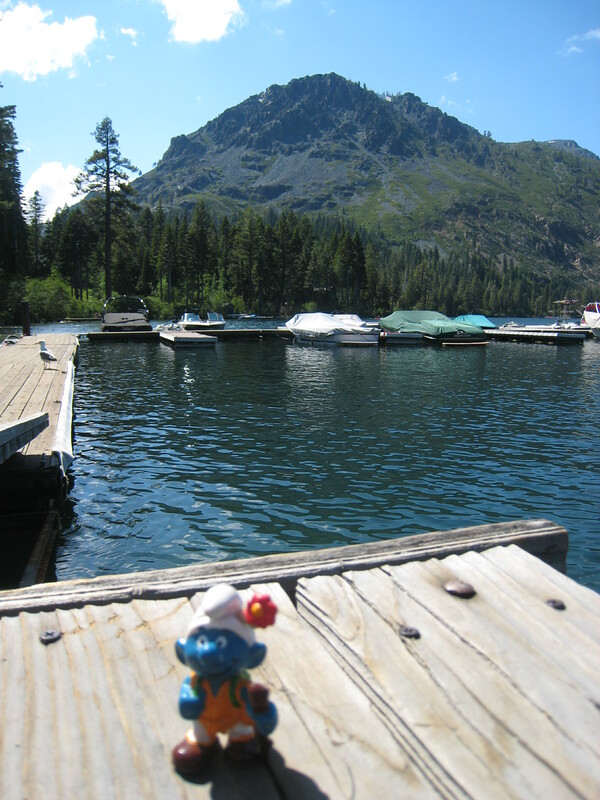 Sweetie and I made it out for another hiking trip this weekend. He worked Saturday and Sunday but was happy to leave work behind on Monday if I scheduled a hike for us. So I pulled out my trusty hiking book and found a nice-sounding trail up on Haleakala, our friendly neighborhood volcano here on Maui. Since we were driving up Haleakala, it was quite natural to stop at the Kula Lodge for breakfast. I got my eggs Benedict while Sweetie ordered a scrumptious waffle with strawberry cream cheese and fresh strawberries. It was soooooo good. Thank goodness we had some vigorous hiking scheduled after breakfast! We drove up the volcano. It’s amazing to me how high you can get so fast. The entrance to the national park is probably only 30 miles or so away from Kahului at sea level. Drive across the isthmus and straight up the volcano, and boom – we were at 6,000 feet. The top of Haleakala is over 10,000 feet. I do want to try out more hikes higher up the volcano. But this seemed a good one to start with. We were actually lucky there was cloud cover because there are no trees on the trail – just a lot of brush and scrub. I imagine it would be quite hot on a sunny day. We climbed up higher and passed the junction of the Halemauu trail that leads to another parking lot. We were soon surrounded by clouds and had to put our windbreakers on because it was pretty chilly. Hooray! It was a gorgeous view. My pictures can’t capture the shades of green and tranquil beauty that lay before us. It honestly looked like something out of a dream for me. It was a great day for a hike. The only bummer was that we heard about a hiker who was hurt on the trail. Right after we passed the trail junction, we saw a man huffing his way up the hill towards us. He asked us if he was far from the trail head. We had traveled about 2.5 miles from our starting point, but the junction also led to another parking lot in 0.7 miles so we told him it was close. He said there a hiker down on the trail (he must have been much farther down on the Halemauu trail) and he was trying to get to the road to help give information to any rescue crew that came. He said they had already called 911. As Sweetie and I hiked back down the trail, we saw the fire rescue helicopter fly over and around us as we took a picture near the junction. I was thinking there wasn’t much the helicopter could do because visibility was so poor. It flew back down the hill. Then, as we were walking down it flew back up the hill. When we got back to our car, the helicopter flew over us again and landed right next to the side of the road. We were driving towards the park entrance when we were stopped by a fire crew member. We saw another firefighter walking a woman towards their waiting truck. She had a fire-fighter’s coat wrapped around her and Sweetie and I thought – “Well, that’s good. Whoever she is, looks like she can walk on her own.” We drove past and headed home. Unfortunately, I found out yesterday that the hiker was an older Maui resident and he died up on Haleakala while out with family members. They don’t know exactly what happened. He was riding his horse while his family was hiking and it seems he and the horse fell. Sad to hear. We get occasional fatal accidents on Maui in the waters but rarely to hikers anywhere on the island. Reminds me to stay safe out in the wild. It’s beautiful but sometimes unforgiving.